This past week was Thanksgiving week in America and many of us may have had the opportunity to enjoy food and drink with family and friends, listing what we are most grateful for this year. But for many, this time of year is also very painful. You may find yourself far away (or estranged from) family, without enough money to throw an extravagant holiday feast, or struggling with seasonal depression, which is very common as the days grow shorter. But regardless of your external circumstances (or what time of year it is), you can, and should, practice gratitude in your every day life. The only way to attract abundance is to practice feelings of abundance. Even if you believe you have very little, or nothing, to be grateful for - you will not have abundance come into your life until you commit to practicing the attitude of abundance on a daily basis. Similarly to when you practice happiness, when you practice gratitude, your feelings of abundance will become immune to external circumstances that may otherwise derail you. Here are a couple of strategies to help you strengthen your sense of gratitude, and thus bring more blessings, joy, and love into your life. Meditation: It is a common misconception that meditation is the practice of not thinking when in fact, meditation is the practice of becoming aware of your thoughts. If you establish a regular meditation practice (even 10 minutes a day can make a big difference), you develop an awareness of your thoughts and when you do, are able to pull yourself back to the breath. This practice will give you space between your awareness and the thoughts that come through your mind. As a result you will begin to gain control over which thoughts you choose to give your attention to (gratitude, uplifting, creative, problem solving) and which ones you allow to pass through you (bitterness, cynicism, doubt, fear). When you tend to your thoughts in this way, you change the way you experience your life. This kind of mastery over your mind goes hand in hand with cultivating gratitude. Keep a Gratitude Journal: Keep a dedicated notebook by your bed and spend a few minutes every night and every morning to list a few things that you are grateful for. While this may sound like a simple and small practice, the results can be life-changing. No matter how little you believe you have, you also have so much. Running water, the Internet, the ability to walk, your favorite food - force yourself to list 3-5 things before bed and/or in the morning when you wake. The result of keeping a daily graitutde journal is you will begin to do this naturally throughout the day. In stead of finding things to worry or upset you, you are training your brain to instead focus on the things that uplift and support you, whether it's a close friend or your favorite Netflix show. 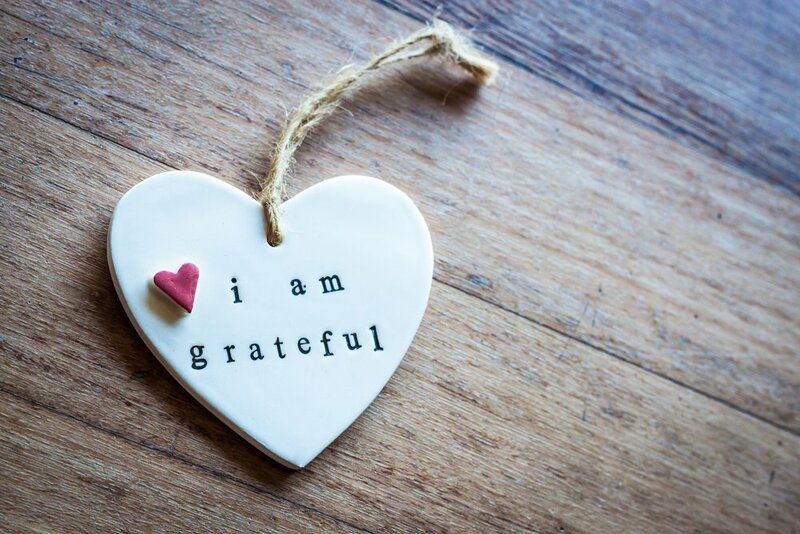 Remember to say "thank you:" Another small practice that will lead to more abundance and gratitude in your life is making it a habit to give thanks regularly. Take an extra moment to make eye contact and thank the employee bagging your groceries, the barista making your coffee, your family or roommate for cleaning up the house or making you a meal. When something good happens to you and no one is around to thank, turn your gratitude towards the Universe and thank Great Spirit for the prime parking spot you found, the unexpected check that arrived in the mail, the solution to the problem you've been gnawing over. For anything good in your life at this moment, give thanks for it. The Universe loves gratitude, and the more genuine gratitude you give, the more abundance the Universe will send to you. So practice gratitude now and welcome the many blessings that will follow.